Tolkein geeks rejoice, for The Hobbit has arrived. Following the broad outlines of the book, The Hobbit: An Unexpected Journey follows Bilbo Baggins (Martin Freeman), twelve dwarves (led by Thorin, played by Richard Armitage), and one gray wizard (Ian McKellen) on the start of an adventure to help the dwarves reclaim their homeland. Why a hobbit? Because Gandalf tells the dwarves that they will need a burglar, and Bilbo is just the hobbit for the job. Bilbo is the reluctant hero, refusing to join the adventure until the thought of another boring day at home — after a long and eventful evening — twelve dwarves arriving uninvited and emptying the larder — sends him running after his new friends. The movie gives audiences two prologues. One is an overview of the dragon Smaug invading the dwarven homeland under Erebor and the exodus of the dwarves. The other features an older Bilbo (Ian Holm) writing to Frodo about the adventure we’re about to see. The movie folows their travels, through one set piece after another, with scenes of dialogue and camaraderie in between. The Great Goblin is one of the more memorable villains. He has a fatty dewlap that hangs down like a beard of flesh. He’s not above singing and dancing, and unlike purely menacing villains, makes empathetic eye contact with our heroes. 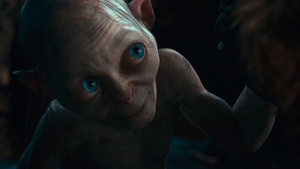 The most outstanding performance of the film goes to Andy Serkis as Gollum. The credits list Serkis as a second unit director as well. Gollum seems less of a monster than he was in Lord of the Rings, and all the more creepy for it. His wide blue eyes are almost childlike. When he’s not cursing and muttering, you can honestly feel sorry for him. He and Bilbo have a very long scene together trading riddles. Even though the movie ends up at nearly three hours, I’m glad Jackson let the Gollum scene play so long; it’s one of the strongest in the film because it isn’t rushed. I’m not a purist when it comes to movie adaptations. The deviations from the book that I noticed seemed well justified. Some make the story flow better. Some add tension and momentum. Others seem to be setting up payoffs in future movies or indeed in the already-produced Lord of the Rings movies. One such deviation is the introduction of a brown wizard, Radagast (Sylvester McCoy), who in an unfortunate irony cares deeply for animals and takes pains to prevent their untimely deaths. (Okay, just one more irony, a quote from a dwarf: “We have no ponies. They bought it.”) The movie sets up Radagast but withholds a payoff until a later installment. This movie is definitely for the Tolkein geeks. Jackson expects the audience to remember the name of one sword too many. I got Foe-hammer and Goblin-splitter, but the mysterious “Morgol blade” (or was it “horcrux”? “MacGuffin”?) that the movie didn’t explain... something to do with a necromancer... my head started to spin. I have not been eagerly awaiting The Hobbit. Critics are rightfully nervous when such a big movie with so many built-in (occasionally rabid) fans hits the ‘plexes. But if we have to have movies like these, then The Hobbit: An Unexpected Journey is not bad. It can’t stand alone — it needs the other films in the series to complete it. But it’s a good first movie, and the cast is gamely charismatic. I’m not a Tolkein geek, but those who are have reason to rejoice.